This leaflet was prepared and distributed by the Good Government Club of Topeka. It was supporting the passage of the women's voting rights amendment on the November 5, 1912 ballot. The pamphlet addresses the question that if women want equal rights they should not expect courtesies from men in a somewhat aggressive manner. It was authored by Lilla Day Monroe, president of the Good Government Club. 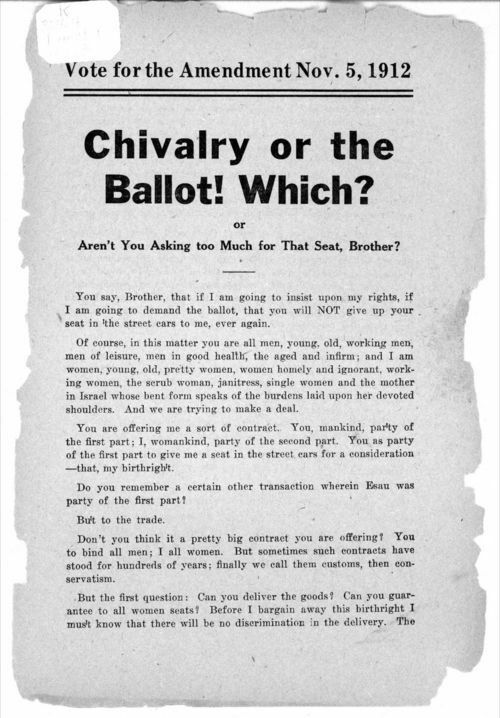 Chivalry or the Ballot! Which? Or Aren't You Asking too Much for That Seat, Brother?